There’s no doubt that politicians and political campaigns need to engage with the web, whether it be for fundraising, event outreach, news, debates and more. While Presidential and other heavily funded campaigns can afford to hire digital consultants like Blue State Digital to coordinate their online efforts, many current and potential candidates simply don’t have the resources and funds to build a fancy platform from scratchEnter NationBuilder, a SaaS platform that allows political candidates to build a sleek website in minutes that supports fundraising efforts, a blog, volunteer outreach, payment processing, calendars and more. NationBuilder includes the ability for non-techies to create a branded website, blog as well as import contact lists and send email blasts directly from the site. In terms of social media NationBuilder allows you to have integrate multiple Facebook and Twitter accounts and Tweet and Facebook Message from these accounts. Even the ability to send mass text messages is fully baked into the platform. One of the most useful features of NationBuilder is a finances dashboard that will track the number of donors, average donation per supporter, amount raised in the day, the month, the year, the primary to the entire election cycle. Users can set a goal for the amount of money to raise or number of donors and a prominent thermometer displays the progress to your supporters. And NationBuilder hooks directly into Authorize.net, PayFlow Pro, and other payment processors. Other features include event management with ticketing, volunteer organization, maps, calendars and uch more. It is essentially a one stop shop for creating a website for a political campaign. Pricing ranges from $20 per month to $500 per month. Email and text blasts are extra and the startup allows users to try out the platform for free for two weeks. 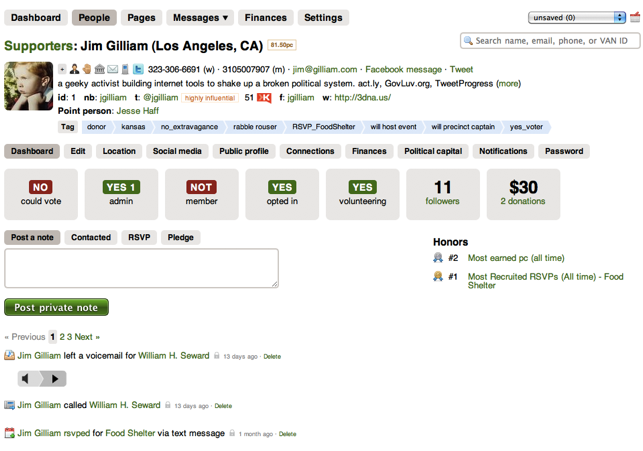 NationBuilder was founded by Jim Gilliam, a documentary film producer who also has significant web experience. He helped launch Business.com as its Chief Technology Officer, and worked at Lycos back in the day. Gilliam founded NationBuilder as a passion project and quickly realized the need for an inexpensive, easy to use platform to help political candidates (and nonprofits) build a presence on the web. 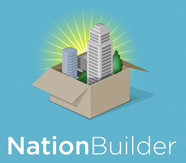 He experimented with an early version of the site last Fall with a few candidates and campaigns, and is now opening NationBuilder up to the public today. With the 2012 election season ramping up, I’d say it’s pretty good timing.